With it being the season of Lent, you may be looking for great meatless options. Even though I love fish, I still get tired of it eventually. Now is a great time to add some extra veggies to your diet – especially spinach! 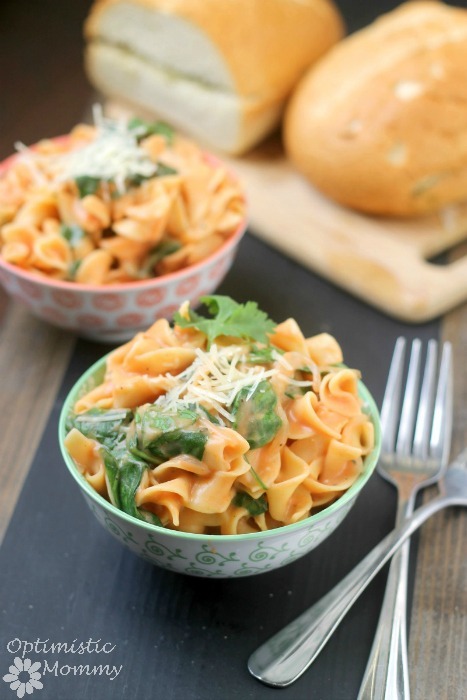 With today’s one pot creamy spinach noodles recipe, you get a hearty meal with a good amount of spinach! Just look at all that creamy goodness! My mouth is watering just remembering how great it tasted. With this being a one pot meal, there is minimal clean up as well. It is really perfect for any weeknight meal. And you can even make some additions if you wish – add some mushrooms and/or tomatoes to up the vegetable intake. The possibilities are endless! 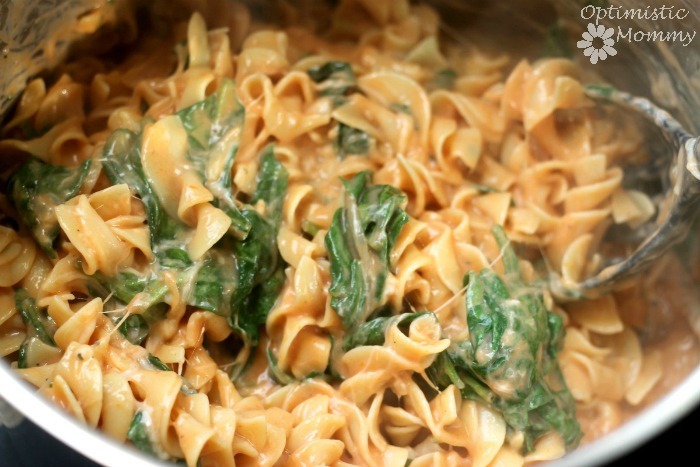 I hope that you will enjoy this One Pot Creamy Spinach Noodles as much as my family did! Service it with a fresh loaf of bread with some butter, and you have an easy meal that tastes delicious. In a large stockpot, fill halfway with water and bring to a boil over high heat. Add egg noodles and cook according to package directions. Drain and set aside. 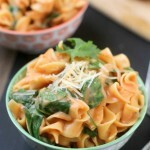 Over low heat (in the same empty pot), mix alfredo sauce, tomato sauce and spinach. Increase heat to medium and cook for 2-3 minutes, or until spinach is starting to wilt. Add salt, pepper, basil, oregano, mozzarella cheese, and half of the parmesan cheese; stir continuously for 1 minute. Reduce heat to low, add the drained pasta back to the pot, and stir gently to combine. Serve in bowls and top with remaining parmesan cheese. Serve immediately. This looks so perfectly creamy, I’m drooling! I love anything with Spinach so I’ll have to try this soon! My daughter is a vegetarian and loves noodles. I am always trying to get her to eat more iron-rich food (like spinach). She’s going to love this recipe. Thanks for sharing it at This Is How We Roll Thursday. Hmm. I have some spinach in the fridge now. Thank you for sharing at Snickerdoodle. Looks yum! This recipe looks like a nice comfort food recipe. 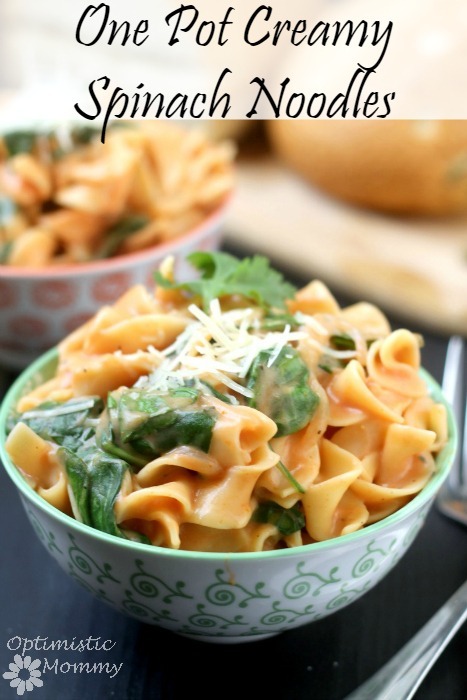 I love adding spinach to my noodles, so I can’t wait to make this. This sounds so simple and delicious! I love the mixing of the two sauces. I’m going to have to make this soon.